On September 2, 1947, at about 2 o’clock in the morning, Officer Frank Rogers was driving a San Bernardino Police patrol car southbound on North Waterman Avenue, with his regular partner, Officer Harris McCullough. They were responding to a disturbance call at the Pacific Electric Bus Depot. As they crossed West 4th Street, a westbound vehicle failed to stop for the posted stop sign and collided broadside with the patrol car. The impact propelled the patrol car about 80 feet before it came to rest in the vacant field on the southwest corner of the intersection. Officer Rogers sustained massive head injuries and died within minutes of the collision, becoming the third officer of the San Bernardino Police Department police officer to be killed in the line of duty. Officer McCullough suffered major internal injuries and was transported to St. Bernardine Hospital. He died two days later, becoming the fourth San Bernardino police officer to be killed in the line of duty. Newspaper accounts of the accident explain that the driver of the car that collided with Officers Rogers’ and McCullough’s patrol car was Mrs. Bertha Threldkeld, 24 years old, of San Bernardino. She was admitted to the hospital in fair condition. Newspaper reporters wrote that she and her husband had been quarreling just before she left home a few minutes before the accident. She was later charged with manslaughter with gross negligence in connection with the deaths of Officers Rogers and McCullough. On October 2, 1947, funeral services were held for the two officers at the Mark B. Shaw Memorial Chapel, in San Bernardino. The fallen officers were honored for their service to the public and numerous uniformed members of the San Bernardino Police Department attended, along with officers from state and local agencies. 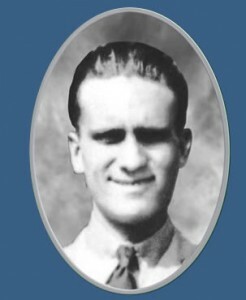 Officer Rogers’ service was held at 2 o’clock in the afternoon and he was buried at Mountain View Cemetery. Frank Rogers was born on May 5, 1916, to Samuel and Myrtle Rogers in Joplin, Missouri, and moved to San Bernardino in 1928. Officer Rogers was married to Adeline Rogers; they had two children (Rosalie and Robert) and resided at 827 W. Victoria Avenue in San Bernardino.